You may fall in love with her or she might overwhelm you with complexities. But India, you will never forget. Myriad faces of despair and splendor, of destitution and opulence, of majestic modernity and primitive superstitions - That is India for you. 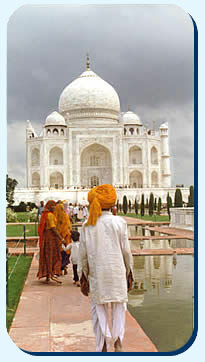 India can dazzle with her beauty, captivate with her hospitality or baffle with her contradictions. Archaeological studies put the origin of the Indian civilization 5000 years back. The prosperity of the Indus Valley civilization, as revealed by the findings at Mohenjodaro and Harrapa declined with the arrival of the Aryans. Gradually human settlements moved to the fertile Gangetic plains. Kingdoms rose and fell. But there were no empires till the 6th century BC, the time of the Buddha and Mahavira. The first empire was formed under the Mauryas. Then came a series of foreign invasions before the Guptas built a great empire and wrote a fine chapter in the socio-cultural life of India in the early part of the first millennium. The end of the 12th Century bought a series of attacks led by Mohammed Ghori culminating in the establishment of the Slave Dynasty in Delhi. They were succeeded by the Lodhis and in turn the Tuglaqs, followed by the Mughal era. The Mughal ruled for over three centuries and this rule came to an end when the last Emperor Bahadur Shah Zafar was taken prisoner by the British in 1857. Meanwhile, the southern peninsula enjoyed greater peace and stability. The Pallavas, the Pandyas, and the Cholas had their hour of glory. Chalukyas reigned supreme in the Deccan and the Rajputs became powerful in the northwest. Then came the Hindu kingdom of Vijaynagar in the South and the Bahamani dynasty in the Deccan. The Marathas followed and it was then that the British chose to visit India. Though the Portugese were the first to set foot in India in the 16th Century, the British overcame the challenge of the Dutch, the Portugese and the French. The British came silently as traders and gradually their military hegemony was established in the entire country. However, on 15th August 1947, India shook loose the imperial British and gained independence. The Indian civilization is characterized by its ability to absorb alien cultures without losing its distinctive identity. The continuity of Indian civilization rests very substantially upon social institutions and the religious values among the different classes and communities. Hinduism in general, is a religion constituted of loose set of values and beliefs articulated in a social order characterized by a distinctive identity. In as much, Hinduism is not a religion alone- it's a way of life. The seminal values of Hindu religion are to be found in the sacred texts like the Upanishads, the Bhagvad Gita and the Vedantas. There is no archaic past in this ancient land. The past lives on, alongside the present in a gentle continuity. The past soars triumphantly in the sculptured temple towers in the south, in the citadels and minarets of the Mughal north, in the external pristine beauty of the Taj Mahal, in the hidden treasures of the Ajanta caves. The age old epic Ramayana is still enacted in the streets for 10 days each year. India also lives in the modernity of Bombay, Delhi, Bangalore and Chandigarh. Rapid industrialization has produced economic change in the country. This merging of past and present is perhaps the strength and the attraction of India. Despite its vast linguistic, regional and religious differences, the spirit of India is implanted deep in the heart of an Indian. Certainly one can take an Indian out of India, but not India out of an Indian !